Hiring a caregiver is a very personal decision and there is a lot of different information and emotion involved. Because of that, you’ve likely spent a significant amount of time interviewing caregiver candidates to find the “right” fit. Once you have found the right person to hire to help provide care for your dad, now comes the hard work of establishing job descriptions, building solid communication, and managing the person without interfering too much. Micromanagement never yields the results you want, yet it is easy for people to get into this routine. It instead leads to higher turnover and caregivers that are demoralized and unenthusiastic about their work. Understanding management versus micromanagement is the first step to making sure you’re not overstepping your boundaries. A micromanager will dictate how everything needs to be done and then watch over all of the steps in the process, essentially not actually delegating any of the task to someone else. Good managers on the other hand, will be heavily involved in the work, but they do that by clearly outlining what outcomes are desired while giving feedback and checking in on the process, so the employee can adjust if needed. The goal of a good manager should be to help the staff member to learn and be accountable. To be a good manager, it requires figuring out what works best with you and the caregiver that is working with your parent. Here are some helpful tips on managing without micromanaging. Tip #1: Clearly convey what you are expecting. If you have expectations but you don’t convey them properly, it can be frustrating not only for you as the employer, but for your caregiver as well. You cannot expect the caregiver to read your mind or understand what you want unless you clearly communicate with them on what that is. So, at the very beginning set goals to describe what it is you are looking for to successfully care for your parent and outline responsibilities. This will help you measure progress and know if your expectations are being met. Common expectations might include socialization - meeting friends for coffee for example a few times a week, exercise, medications, and meals. 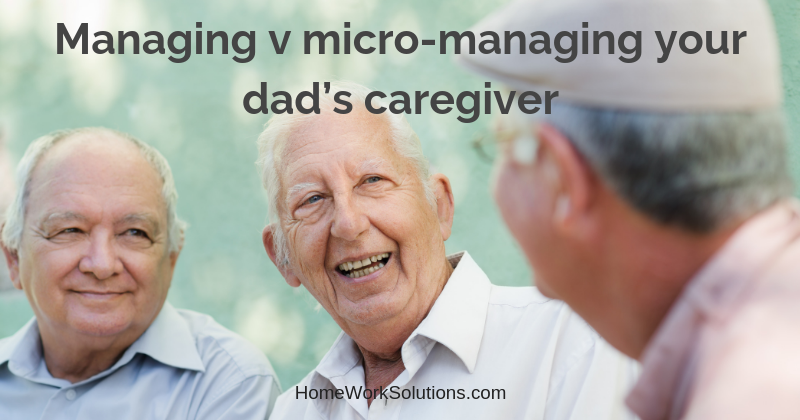 If dad's caregiver provides some light housekeeping do include things such as laundering towels and linens, clothes, and straightening up after meals. Tip #2: Focus on guidance. A good guide is invaluable when it comes to working with a new caregiver. This person will likely have some questions and need some guidance on some things at first, but instead of jumping into doing all the work yourself and monitoring every single detail, focus on being a resource for the caregiver rather than the one that has their hands in everything. Consider providing guidance on activities your father enjoys, mealtime preferences, and any tell-tale behaviors to be aware of related to health issues. Establish a time every week or every month that you and the caregiver can sit down and talk about how things are going. This is also a time for both of you to ask questions, get input, and agree on care plans if necessary. Check in times are key to fostering strong communication and establish rapport with one another. Technology can be your friend too. Text information to your caregiver as needed, particularly concerning appointments and any health issues. Encourage your caregiver to text and even send photos of dad with his friends at the diner for example. Once you have found a caretaker that you trust, it’s important to build loyalty so they can continue providing services to your parent. With proper managing skills, you can build a relationship with your parent’s caretakers that fuels growth and keeps them happy for years to come.